Judy Murray has been fighting for women in tennis her whole career and has now called on Serena Williams and other top players to follow her lead. Murray resigned as Great Britain Fed Cup captain two years ago partly because of her frustration at the format, and she said: “I think it needs more of the top women players to push for change on the women’s side of the game because change is always driven from the top. So, if somebody ranked 60 or a Fed Cup captain from a lower zone like myself [calls for change], of course it will have some kind of impact, but it doesn’t drive anything through. On the men’s side, if you’ve got Andy and Rafa and Roger and Novak pushing for change, whether that’s Davis Cup or better distribution of the profits from the grand slams, they’re going to sit up and take notice. But we need top women to do the same thing. 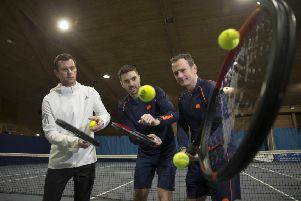 Having been one of the few elite female coaches in Britain, in recent years Murray has focused primarily on the grass-roots and trying to attract more women into tennis. She created two programmes: Miss Hits, a fun introduction to tennis for girls aged five to eight that has proved a success around the world, and She Rallies, which is growing the female coaching workforce in Britain as well as encouraging more women and girls to take up the sport.